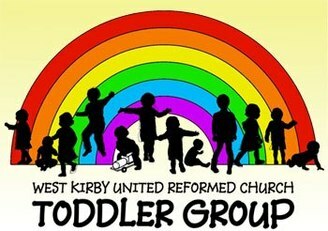 West Kirby URC's Toddler Group meets in the halls on Fridays in term-time and offers two action packed sessions for children, and a chance for mums, dads, grandparents and carers to enjoy quality time with their children and with new friends. The first session is from 10am to 11:30am and the second session from 1:00pm to 2.45pm. Mums, dads, grandparents and carers can relax and enjoy a tea or coffee and a posh biscuit and, towards the end of the session, children are invited to sit at their own tables and enjoy finger treats of apple slices, cheese squares, raisins and bread sticks, complete with a drink of water or juice. ​Each session of Toddlers concludes with a family Sing Song time in church with activity songs and percussion instruments. We have a ﻿waiting list ﻿to join the group but if you are interested and live in postcode area CH48 or CH47, then please visit us, either at the morning or afternoon session, and then fill in the application form. When a place becomes available, you will be contacted to invite you to come along. If you have any questions about Toddlers, please contact us. Keep up to date with all our activities by liking WK URC Toddler Group on Facebook or find out more about our Toddlers for Dads group here. An opportunity to come together to worship and pray ... in the noise... in the silence ... sing, dance, draw, create, pray, listen, read, reflect... as the Spirit leads. Everyone's welcome to drop-in any time from 7.30pm. We're usually done by about 9pm. Contact Dan Sach for more information.